FRIDAY Night Live (FNL) is set to make a mark with a unique, creative and different vibe that is far from the traditional image of "church." Fun, not stiff, wild & crazy (in a good way) best describe FNL's atmosphere while making it a judgment-free community. 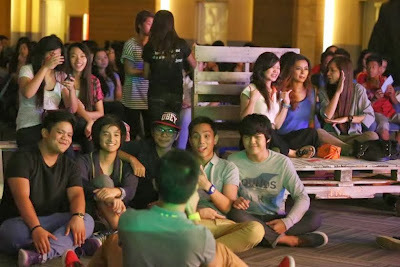 FNL is a community gathering of the youth under a local church, Alabang New Life Christian Center. It is best described as a group of people coming together under one roof with different backgrounds, social status, situations and challenges in life, and be in one place to connect. Get to experience a different kind of church in which a group of young people are passionate for Jesus, having one thing in mind - to create a venue where young people can hang out and be themselves; no pretension, no labels and no pressure. The FNL hashtag says it all - come as you are. "We want to start a counter-culture to what we know "church" to be. We want to build a community and relationships with people, instead of making people think that they are forced to change. Imagine a place where we boast in our weaknesses instead of hide them. When we are honest about what we struggle with, we actually strengthen each other because we know that we are not alone in our struggles. Having said this, it’s not our job to change people. What we are doing is building a community and connecting with people." Shares, Steven Chase of Friday Night Live. “FNL is a hub for people with weaknesses, where people can show off their weakness and not merely accept them with shame. We're starting a culture that says "Come as you are," and don’t tell people that they have to change or be someone they are not.”Adds, JB Landrito of Friday Night Live. Friday Night Live wants young people to know that church can be insanely fun. With its pre-hang activities like beats by up and coming DJ's, blog worthy food trucks and a craft coffee bar, FNL seeks to draw in a crowd of high school, college and twenty somethings. Check out @fnliveph (Instagram,Twitter) FNLivePH (Facebook) for more information about Friday Night Live happening every first Friday of the month.